Last October Gretel and I were invited to attend the PetSafe Paw Print Blogger Summit in Knoxville, TN. The approval to bring Gretel came last minute, and I had never flown with her before, so I was left scrambling to find an airline approved pet carrier. Sleepypod came to the rescue. They were kind enough to send me a Sleepypod Air In-cabin Pet Carrier to take on our trip in exchange for sharing my thoughts about it. When the carrier arrived, I immediately loved the soft and plush pad on the inside. I didn’t think Gretel would have an accident in there but I liked that it was removable and washable just in case. The Sleepypod Air was the perfect dimensions for us. Gretel is 10 lbs, about 12 inches long (without tail) and 7 inches tall. She had room to stand up, turn around, and lie down in a natural position, like the airline requires, when the carrier was expanded full size. There a handle across the top of the carrier and one strap that can be used to carry the bag across your body like a messenger bag. Carrying the bag across my shoulder was pretty comfortable. A friend of mine had warned me that the strap could make my shoulder sore but I set the pad strap to the bony outside of my shoulder and, although I was aware I was carrying a 10 lb dog, it wasn’t super uncomfortable. There is a second “option” for carrying the bag when walking through the airport – opening a zipper on one side and sliding the carrier over the handle of your rolling suitcase. I tried putting the bag over the handle of my carry-on suitcase to give my shoulder a rest but it didn’t work. The zipper opening is wider than the suitcase handle is so the carrier shifted side to side when Gretel moved around. I tried to close the zipper part way to make the opening smaller but it still wouldn’t fit snugly around the handle. It might have worked if Gretel was lighter or the suitcase had been larger. While I was walking through the airport Gretel just laid down and observed the word for the most part. If she was moving around she had a tendency to slide to one end if the bag and tilt it on my body. Those times took a bit of adjustment to even her out but it was no big deal. There are, essentially, two outside pockets on the carrier. There is a dedicated pocket on one side and the bottom zipper on the luggage sleeve can be zipped shut to form a second pocket on the other. During our trip I learned, among many other lessons, why it’s essential to have pockets on the outside of any in-cabin pet carrier. I used the handle across the top of the carrier when boarding the plane. I was able to easily turn it long ways to fit between the seats with plenty of space to spare and it was comfortable to carry. When I got to my seat, I folded up the ends like they are designed to do and, with a little pushing, squeezed Gretel under the seat in front of me. American Airlines requires that in-cabin pet carriers be no larger than 19″ long x 13″ wide x 9″ high to fit under the seat during takeoff and landing. The airline has a policy that all parts of the dog must remain inside the carrier during the flight but doesn’t require that the carrier stay under the seat the whole time. For your pet’s comfort, the instructions for the Sleepypod Air tell you to pull the carrier out from under the seat and turn it length-wise between your feet so it can expand to full size (22″ long ×10.5″ wide ×10.5″ high) once the seat belt light is turned off. I am not sure how Sleepypod could make it work because the sides of the carrier needed to be rigid but it would have been nice to have a small window in the sides of the carrier. The top and ends of the carrier are mesh but are not visible when the carrier is under the seat so I couldn’t see Gretel. Despite the inside pad being removable and washable, I did buy the (affiliate link) DryFur absorbent insert for the carrier. It covered up the cushy pad and made the bottom a little harder than I liked though so I didn’t use it on the return flight. I’ll probably be sorry if Gretel ever has an accident in-flight though because it would be way more complicated to clean up. I didn’t use this feature but straps on both sides of the carrier allow it to be secured in a car. Sleepypod crash tests its entire line of dog harnesses and pet carriers in the same frontal crashes that ensure the effectiveness of child safety restraints. Unlike most pet restraints that that are designed only for keeping your dog from roaming lose in the car and distracting you, each Sleepypod pet carrier is designed to secure a pet in the seat and keep them from flying around in the case of an accident. If I had rented a car when I reached my destination, I would have really appreciated this feature. 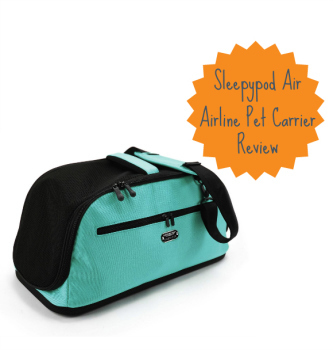 I’ve never used any other pet airline carrier but, overall, I had zero complaints about the Sleepypod Air. I look forward to using it the next time I fly with Gretel. You can purchase the Sleepypod Air through for $159.99 on the Sleepypod Webiste. The limited edition robin’s egg blue carrier we have is not available until spring but several other colors are available. You can connect with Sleepypod on Pinterest or Facebook. We love Sleepypod! Ammo has the air too, and while we’ve tested it on a bike ride (Sleepypod has a special bike rack attachment for it called the ), we have never flown with it. Ammo is a bit bigger than Gretel at 20 lbs, but still fits in and seems to have no problem being in it. Amazing for a dog who normally hates crates! We have the Sleepypod for Roxy in the truck, and the harness for Torrey. That’s nice it worked so good on the airplane. Did Gretel bark, or whine? I don’t plan on flying anywhere, but I have always wondered how it effects dogs. Does it hurt their ears? You forget the part about how to make my 38 lb self shrink enough to fit in such a carrier! I think if I were an only dog and real small I would fly a lot, but at my size, we have to drive and also with two or three of us traveling. Neat thing for little ones, though. I don’t think I (a German Shephard) fit into that Sleepypod, allthough mom wish I did LOL. The family of my foster Dachshunds plans to fly them to China where the mom is now teaching (before was Mongolia). Have forwarded both your posts on flying with Gretel to them. Their dogs are the same size if not smaller (at least Luna) as Gretel, the SleepyPod sounds terrific, and I think they should fly in the cabin with mom and daughter. Apparently, each dog in flight needs their own human because I offered to fly them over :). Thanks for some excellent information for us! I am not sure what you mean by “have I heard back”? I am the one that flew with my little Dachshund. Please clarify if I am missing something. Oh, sorry. I see now that you were wondering if Roberta had heard anything more about what it was like to fly with a dog to China. Hopefully she has and can help you out there. 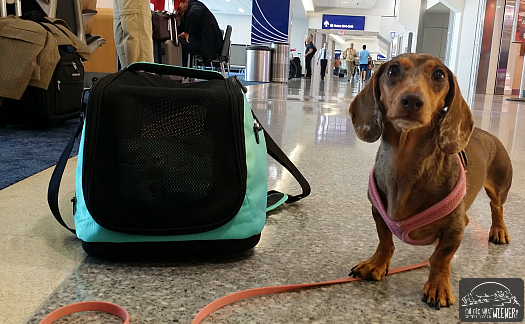 Well, the last I heard, my wee Dachshunds are staying stateside with me – forever fosters with an overseas family. They ran into a Catch 22: they could fly into Shanghai with the dogs in cabin but then face a long quarantine OR send them “cargo” to Hong Kong,, which I truly don’t think the smallest, not adventuresome boy would survive. I’ll let you all know if things change and would love to hear how your flight goes! I may have the cities confused but the conundrum remains the same :(. Hi Roberta. Thank you for your update. I’m doing some fancy footwork myself to avoid the dreaded quarantine which you referred to. I’ve discovered that flying directly into Chengdu will allow pets to enter the country without quarantine, whereas flying into Shanghai or Beijing requires a 30 day quarantine…and you’re not allowed to visit during that time. Yikes! Not an option. I do not want to derail this post, so I will close, but I’m sure your fostered little ones are very, very happy where they are. I will let all know about our Sleepypod adventures once we get there. Fingers crossed! I love her blanket that she flew with where did you get it and did you have any hard time through tsa with her? I love the little blanket too 🙂 It’s a baby blanket I picked up from a discount store. Going through TSA with Gretel was fine. I am always stressed when I go through the TSA on my own anyway. I feel rushed to take my shoes off, get everything out of my bag, then grab the stuff fast at the end. Since I had to also remove Gretel from her carrier, it could have added some stress. However, I was at the airport at 5 am and there was barely a line at security. I was able to step off to the side and prepare my stuff for screening without feeling pressured by the people standing behind me in line (since they could just pass). The TSA agent didn’t handle her but I did have to stop to get my hands tested for explosives. I have heard many people that walked through security with pets have to do that. 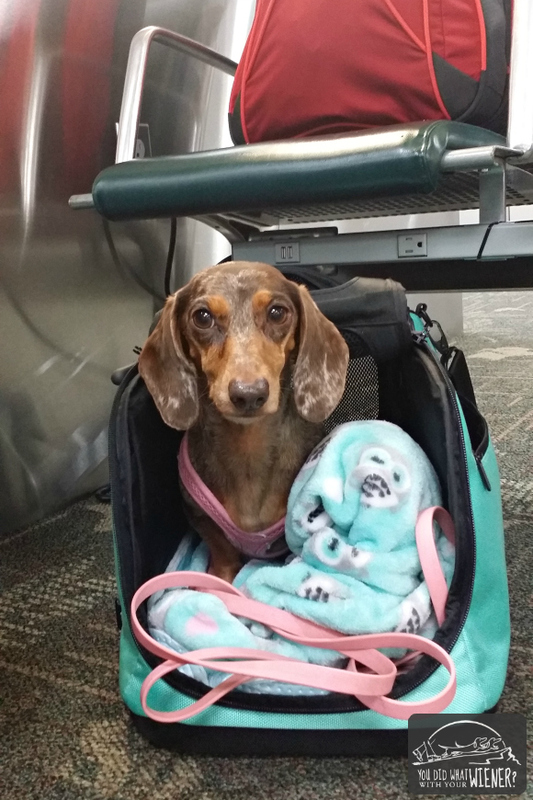 I am flying with my mini dachshund to vegas from seattle on alaska airlines. the airlines strict regulation is 17″ carrier. This proves as a problem for me since my mini dotson is roughly 21″ long. could you please give me specifics on how long gretel is and what airline you flew on? Hi Anjel. I don’t remember what airline I flew on at the time I wrote this post. It might have been Alaska. I recently flew with Gretel using the same carrier on Delta though. Gretel is approximately 14 inches long from shoulder blades at the base of the neck to the end of her bum where her tail starts. It sounds like your Dachshund is a bit bigger than she is. The carrier in this post, the Sleepypod Air, is 22 inches long without the ends folded to fit under the airplane seat. When it is compressed under the seat, it can fold as small as 16 inches long. Dachshunds have a tendency to curl up so I would imagine your pup would fit in the carrier when it is fully expanded. However, I think your pup would be pretty cramped when the carrier is compressed under the seat. Since the carrier only has to be under the seat for takeoff and landing, your pup may be able to tolerate being cramped for a short time. However, the airline counter attendant is the one making the determination of the appropriateness of your pup to fly. I didn’t get a lot of questions the two times I have flown with Gretel and no one asked to actually see her inside the carrier. I have heard of people being asked though. The bottom line is that your pup is borderline passable to fit under the seat so it’s up to you whether you want to try it or not. I am not very experienced flying with small dogs so if you need more information, please check out my friend’s blog at http://www.dogjaunt.com. Hi Mimi. I apologize for my delayed response. I did measure my dog from foot to shoulder but quickly realized, after getting the carrier, that I should have measured from foot to top of head with her standing. If I had measured that way though I would have thought she was too big for the carrier since the Sleepypod air is only 10 inches tall and she is taller than that foot to top of head. She fit just fine though. The rules for more pet carriers, according to airlines, is that a pet must be able to stand up and turn around. It doesn’t specify that they must be able to fully extend their head up. That being said, the “scary” part is that it’s up to the airline attendant to determine whether your pet has proper room inside the carrier (if they even check. Many do not). I have heard a couple of horror stories where the attendant was an animal rights person that didn’t believe that pets should be kept inside a small carrier for a several hour flight at all so they were VERY tight with the space rules. The reality is that there IS always a possibility that you could be turned away at the flight check in counter if they thought the carrier was too small for your dog. I think that is unlikely but I always like to have a plan B. When I fly with Gretel, I have my hubby drop me off and wait in the airport cell phone waiting lot until I have been cleared by the airline agent. That way he could come get her from me if I wasn’t allowed to fly with her. If he wasn’t available to do it, I would probably see if I could find a friend that would.